HomeDrug Addiction2/3 of U.S. Residents Who First Started Using Drugs in 2013 Began with Marijuana. An estimated 2.9 million persons ages 12 or older used an illicit drug other than alcohol or a prescription drug non-medically for the first time in the past year, according to data from the 2012 National Survey on Drug Use and Health. Two-thirds (66%) of these new users reported that marijuana was the first drug they tried. 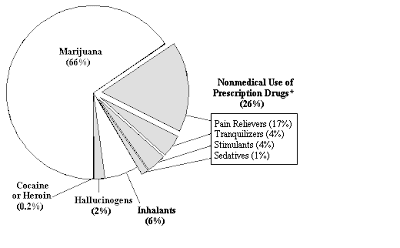 Slightly more than one-fourth (26%) reported that prescription drugs used non-medically were the first drug they tried, including pain relievers (17%), tranquilizers (4%), stimulants (4%), and sedatives (1%). Less than 10% reported that their first use of drugs involved inhalants and hallucinogens, and very few initiates started using with cocaine or heroin. These findings suggest that drug use prevention efforts might focus on marijuana and the nonmedical use of prescription drugs, as these are the drugs that are most often used first. Non-medical use of prescription drugs is defined as use of pain relievers, tranquilizers, stimulants, and/or sedatives without a prescription belonging to the respondent or use that occurred simply for the experience or feeling the drug caused. It does not include use of over-the-counter drugs. SOURCE: Adapted by CESAR from Substance Abuse and Mental Health Services Administration, Results from the 2012 National Survey on Drug Use and Health: Detailed Tables, 2013. Available online at http://www.samhsa.gov/data/NSDUH/2012SummNatFindDetTables/Index.aspx.